Imagine a world where musicians master their instruments and voices by playing (solo and as a group) until they know that their music is good enough for the public to hear. Where musicians get together to play music that they believe in; music that’s passionate and inspired. Where success is measured in emotional response, not midweek chart positions. Where the playing is more important than image, and integrity is more important than overnight success and bread and circuses TV shows. Where bands play live and it sounds better than the vinyl/CD/download because it’s not all about clever production and autotune. Where a singer isn’t some deluded hyper-melismatic Whitney wannabe. Where bands actually respect their audiences. I visited that world two nights ago when I saw Stone Foundation headline the Delicious Junction fifth birthday party at The 100 Club. After a variety of short support sets, including one from Simon Wells, who was unfairly ignored by most of the audience (despite a guest appearance from SF’s Gary Rollins), it was time for the main event. It was big smiles all round from the audience, and the band, playing their third sell-out 100 Club gig this year; and it was bass player Neil Sheasby’s birthday. The band opened with the title song from the latest album, “To Find the Spirit”, and from that point on it was their night. Stone Foundation doesn’t make any distinction between support and headline sets; the guys just get on and give it the beans. This is a gang in the great tradition of Dexys; it’s not about individual egos, it’s about the big picture and this picture’s a masterpiece where every element counts. Underpinning the band’s sound is the rock solid rhythm section of Neil Sheasby and Philip Ford; it’s not necessarily fussy, but it provides the core for everyone else to lock in to. They’ve played together for a long time now, and it shows. New recruit Robert Newton’s congas add a subtle new flavour to the live sound, while Ian Arnold’s keys and Neil Jones’ guitar fill out the mid-range and add some melodic flourishes. Neil Jones is one of those singers who sound better live than recorded (and I’m not saying that he sounds bad on the albums). And then there’s the icing on the cake; the horns. Gary Rollins (sax), Spencer Hague (trombone) and Gareth John (trumpet and flugelhorn) are spot on as an ensemble punching in three-part fills but individually they all take solos which fit perfectly with the songs without going over the line into self-indulgence. As an old Stax and Atlantic fan, I’ve always loved the Hammond and horns combo, particularly when it includes the more subtle flavours of trombone and flugel, and these guys are the real deal. The set was split between songs from “To Find the Spirit”, including the title track, the epic slow groove of “Don’t Let the Rain” and “Wondrous Place”, and old favourites like “No More the Fool” and the stomping “Tracing Paper”. There was even a surprise during the encore as the band motored through a cover of “Jumping Jack Flash” and then it was all over. Oh, and a bit of DJ set from Paolo Hewitt as well; what more do want from a gig? 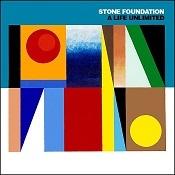 It’s been a good year for Stone Foundation; “To Find the Spirit” charted well in the independent chart, Paul Weller endorsed it, they’ve had national radio play and Sky Sports is using tracks from it regularly. 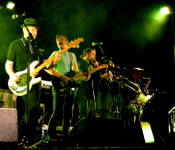 The band has had support slots with The Selecter and The Blow Monkeys and toured as headliners, and with Nolan Porter. They’ve also had a DVD out over the summer, put together by Lee Cogswell and they’re doing a Japanese tour in November. This is a bunch of people who are passionate about their music and willing to put in the hours and the miles to bring it to the public, whatever it takes; I truly admire them for that dedication and I hope their star continues to rise in 2015. Maybe it’s time to welcome the new soul vision.